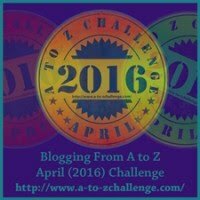 A Postcard a Day: Thunderbirds are go! 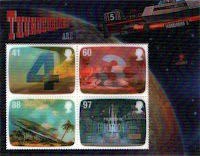 Fractionally over two years ago, the Royal Mail produced these 3-d Thunderbirds stamps to mark 50 years of work by their creator, Gerry Anderson who has so recently died. I do like the PHQ cards that were issued but if I'm honest, I don't like the stamps. They really don't scan very well but the mini sheet I have doesn't even look good to my eyes anyway. It's not like the usual mini sheet but more like a card, in fact almost as sturdy as the PHQ card itself. 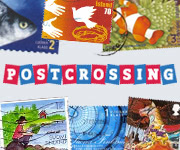 I do wonder how the individual stamps would fare going through the post office machinery. And - where is Lady Penelope? This is a set that I totally missed! I probably would have bought these, but how can they do Thunderbirds without Lady Penelope or at the very least her car! I preferred the 'normal' stamps they produced for Thunderbirds although the 3D was an interesting experiment and got a lot of publicity at the time. I always liked the countdown in the intro as I see from your heading so did you. I am sorry to say I am unfamiliar with these stamps. And they do not scan well but must look great in person. i am sure they look better 'in person' :) beats the definitives..! I am also unfamiliar with them, so had to look it up. thanks youtube! I agree, 3D stamps don't scan well as I have a few, too. Thunderbirds - I thought it sounds familiar but not really. I had to look it up as well. Sad to hear the creator died recently. 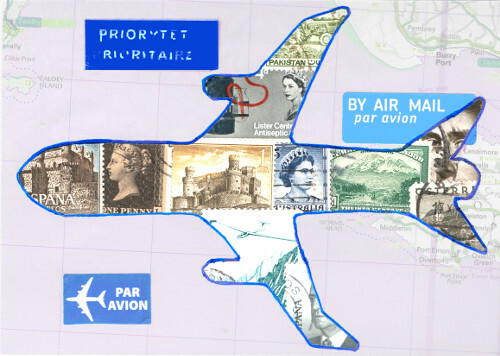 I think these stamps look pretty cool. It looks like a holographic effect? I know the Thunderbirds, but am not all that familiar with the show, so I quite like the countdown element of the stamps - I think it is quite clever. Quite, where was Lady Penelope? I remember seeing the show here when I was a kid.